People come to Austin for lots of reasons—music, barbecue, jobs—but the reason they can stay is the water. Barton Springs, Lake Austin, and Decker Lake are just a few of the places where you’ll find Austinites staying cool on a warm summer day. We are not Austin without water. But, like many other cities experiencing fast growth and climate change, we have to work harder than ever before to ensure that the water we depend on will be here for the future; why this year Austin is planning not only for the next drought but for the next 100 years in a completely new way of looking at water. What goes for swimming holes also goes for our drinking water, which comes from the Highland Lakes (the six lakes along the Colorado River northwest of Austin, including Lake Buchanan, Inks Lake, Lake LBJ, Lake Marble Falls, Lake Travis, and Lake Austin). In a typical year, we lose as much water to evaporation as the entire city uses. In our most recent drought, these lakes fell to a third of their total capacity. For Austin, that is a risky proposition. We have made tremendous gains in water conservation and begun recycling water through our “purple pipe” system, but our water supply is still largely dependent on storage in the Highland Lakes. And with a net average of 100 people moving to Austin every day and average temperatures on the rise, now is the time to plan for additional investments to ensure that our city will always have enough water to drink, to swim in, and to help us manage our growth responsibly. When the Austin Dam burst in 1900, Austin was forced to rebuild itself and rethink our relationship with water. Since then, our population has doubled in size every 20-25 years and today we have almost a million neighbors. And now, on the heels of drought, we must reinvent ourselves again if we are to be sure that we can provide water for the four million people expected to call Austin home by 2115. That is why the previous Austin City Council started the process to come up with a 100-year water plan referred to as Water Forward. Led by citizens, experts, and stakeholders, this process examines innovative and integrated ways to manage our water sources, how we use our water, and where. The proposed supply portfolio, to be presented to the City Council this fall, is expected to include proposals for Aquifer Storage and Recovery (water stored underground to reduce evaporative losses like those from the Highland Lakes), reuse water generated at Austin Water’s treatment plants and building-scale reuse systems, and water conservation strategies that tap into flows of water we have never viewed as resources, like air conditioning condensate. At the heart of this plan is a new way of looking at water called One Water. It’s a concept that looks at water resources holistically so we can find sustainable and durable solutions to the challenges of the 21st century. 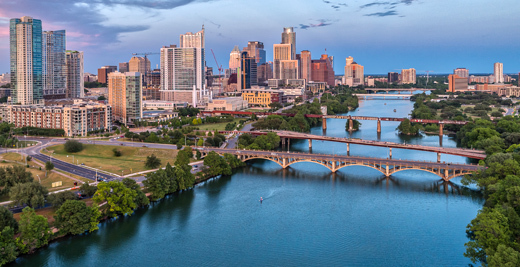 One Water is right for Austin because it views growth as a resource: Instead of being seen as only demands on the system, new developments are seen as sources of water, from the condensate they produce to the rainwater they can capture and store. Instead of building our storage, pipes, and pumps ever bigger to satisfy the water demands that spike in hot summer months, One Water allows us to look at right-sizing our systems to provide potable water only for the uses that demand it—and in the process, right-sizing water rates for households and businesses. Further, One Water is right for Austin because it looks at economic vitality as the product of reliable water supply and abundant, clean flowing water for all Austinites to drink, swim, and recreate in—no matter in what neighborhood or century they may live. We have an opportunity to leave a legacy of stewardship, conservation, and innovation in Austin with Water Forward, our 100-year water plan. Austin’s City Council and this community have a chance to think strategically about our water future and what kind of city we want to leave as our legacy. This plan reinforces that no matter what issues we are faced with, we will remain Austin—a community that is connected and sees ourselves as one. For us, One Water is the Austin way forward. The Hon. Steve Adler is the mayor of Austin. He has been a practicing attorney in Austin for 35 years. Previously, he served as chief of staff and later general counsel to Texas State Senator Eliot Shapleigh. He has also worked with or board chaired Austin-based nonprofits, including the Texas Tribune, Anti-Defamation League, GEN-Austin, Breakthrough Austin, and Ballet Austin. He graduated from Princeton University with a B.A from the Woodrow Wilson School of Public and International Affairs and earned a J.D. from the University of Texas at Austin School of Law. He may be contacted via Twitter @MayorAdler. Sharlene Leurig is project director of the Texas Environmental Flows Project and a consultant on sustainable water investment products. Previously, she directed the Sustainable Water Infrastructure Program at Ceres. She serves on the Board of Directors of the Hill Country Alliance and is chair of the Austin Integrated Resource Planning Community Task Force. She is a frequent contributor to the news media. She graduated with a B.A. in physics and English from Washington University in St. Louis and earned a Master’s in city planning, environmental policy and planning from M.I.T. Sharlene may be contacted via Twitter @sleurig.